This Airbrush Set has split design, replace the nozzle easily. 0.3mm, 0.5mm, 0.8mm, three sizes of spray nozzles, 2CC, 5CC, 13CC, three sizes of cups, these are for different demands. 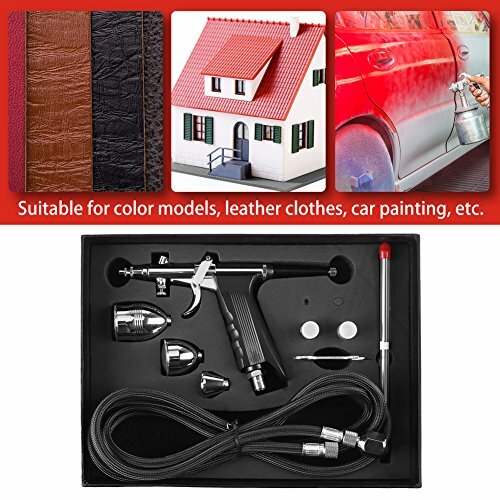 Suitable for color models, leather clothes, car painting, etc. 【Convenient】This spray paint gun is made of stainless steel with an aluminum cup. Using split design for full adjustment over spray pattern fluid control and air pressure.more convenient to replace the nozzle. 【Effective Spraying】Capacity with three sizes of the cup. It is convenient to choose different sizes according to the spraying of the cup, more effective spraying. 【Easy To Spray】On pot style, With the Spray Gun the operation does not block the line of sight, easy to spray.0.3mm, 0.5mm, 0.8mm, three sizes of spray nozzles, meet for different customers' needs. 【Applicient】Designed to provide equal atomization and partical size for all kinds of surface painting, suitable for spraying cars, machines, furniture, instruments, drawings, toys, crafts and small spots.